As far as it is known, card counting systems can be created and developed for blackjack players of different level of knowledge: some of them are easy to understand for beginners, other ones were developed only for advanced players who knew the basics of card counting perfectly. 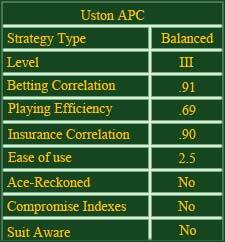 Uston APC Count is a 3-level counting system, and it was developed for advanced players by a notorious blackjack player, expert and writer - Ken Uston - in 1980s. He did not use this system personally though it was really workable and it was possible to find many admirers of Uston APC Count who chose it to be the best and profitable counting system. This system was perfectly described by Ken Uston in his book Million Dollar Blackjack; APC means Advanced Point Count and it is a complicated method of card counting. As you can see, Aces are counted as neutral cards here: it means that you have to count them separately from your general count, and it can be one of this system's drawbacks. Maybe that is why Ken Uston chose another system himself, as this system is recommended only for advanced and experienced blackjack gamblers. Uston APC Count is a balanced system, and it means that you should start your counting with 0 and end it with a zero too. Do not forget to count not only your cards, but also the cards of a dealer and other players!